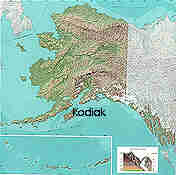 Kodiak Island is the second largest island in the U.S. and is 3,620 sq. miles of breath-taking beauty. The Ayakulik river is surrounded by the Kodiak national Wildlife Refuge which contains approx. 4,000 of the Famous Kodiak Brown Bears. The Refuge is also home to populations of Sitka Blacktail Deer, Beaver, Land Otter, Reindeer, and Elk. Off the coast of Kodiak Island you will find Halibut, Cod, Sea Bass, Flounder, King Crab, Dungeness Crab, and Whales including Orca, Humpback, and California Gray. Also there are Sea Lions, Harbor Seals, Sea Otters, Bald Eagles, Puffins, Kingfishers, Loons, and several other types of birds. At low tide you will find Clams, Mussels, Octopus, and Sea Urchins. As the Native Alutiiq people say, "When the tide is low, the table is set".